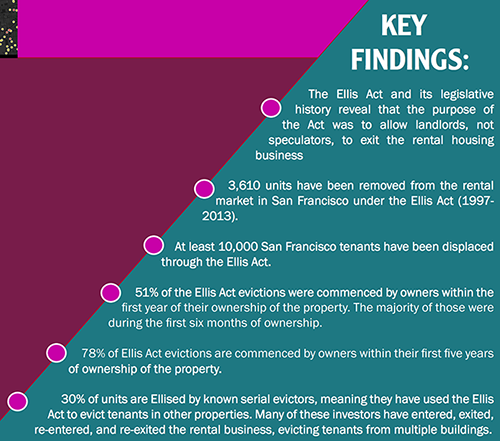 The Anti-Eviction Mapping Project released a new study that documents how the Ellis Act is used primarily by new buyers to evict tenants rather than its original intent of giving longterm owners a way to exit the rental market. Courtesy of the Anti-eviction project. If it makes more financial sense to remove a unit from the rental market for five years than to collect rent from a rent-controlled-tenant living in the unit, there is something seriously wrong rent control laws as they are currently written. Exactly, Zaphod, the activists demand that all these tenant protections are put into law and then scratch their heads when they see owners exiting the business. Do they really seriously not see the connection? The “Project” misses the point. Buildings get Ellised because they are no longer viable as rental buildings, because of rent control. So it is the cashflows that drive an Ellis and not who owns it. That said, a new owner will typically have a higher cost basis and so the motivation to Ellis become more compelling for a new owner. If you stopped new owners from Ellising then the only difference would be that I would “Ellis, then sell” rather than “sell, then Ellis”. The distinction is moot. Owners will continue to exit the rental business if local regulations make it unprofitable. Landlords are not charities nor are they welfare providers. You’re right. The tenants are welfare providers—for their landlords. Only someone who had never been a landlord would think it is not a vital, difficult and risky enterprise. You clearly did not read the report. 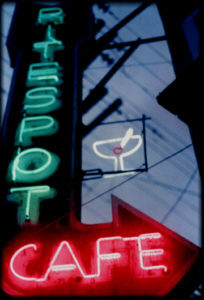 The Ellis is not used by longterm landlords but speculators. Speculators are not landlords and do not deserve sympathy. Using the ellis act does not create housing opportunities. These speculators are bottom feeders who get rich on flipping property and ruining tenants lives. Including 98 year old women. 71% of Ellis evictions involved Seniors. Maybe you ought to think about the moral implications of removing these citizens before you get all high and mighty about speculator’s costs. You missed my point, Sigmarlin. These so-called speculators are the one who actually file the Ellis evictions. But they are not the cause of them. A landlord who is done with subsidizing his tenants has a choice. He can either Ellis or sell. and if he sells, the only buyers he will find will have to Ellis. Some owners feel bad about Ellising and so sell. It’s not their fault if the buyer then Ellises, is it? The real solution is to make being a long-term landlord viable. Why won’t you consider that? Erin needs her hole closed. Could explain all those evictions, huh? Where’s the flagging option, MissionLocal, for psychopaths who offer absolutely nothing to the conversation? I hope the FBI is tracking your IP. pete yah you dont have to be such a cool guy next time alright. 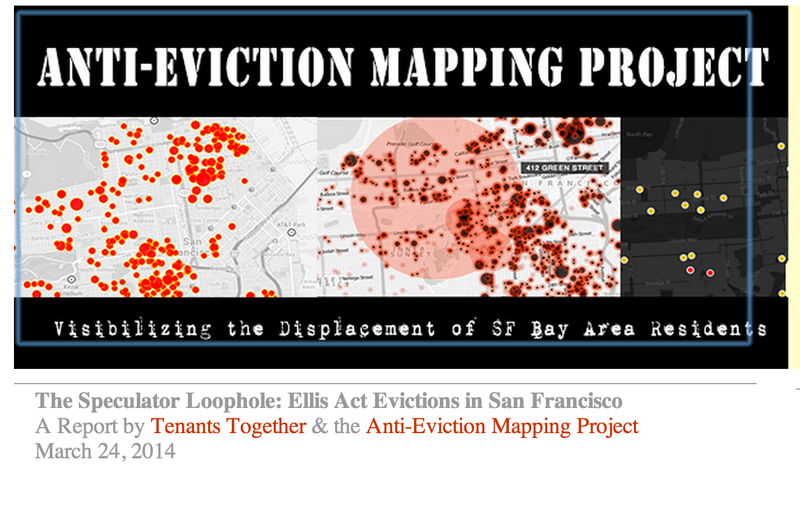 Ellis Act abuses by greedy/unscrupulous landlords and speculators will need to come to end. These reports highlight what’s really happening in our neighborhoods. Let’s close all the loopholes ASAP! The reform of the Ellis act would not affect REAL retiring landlords. This report is about SPECULATORS who are the predominant users of the Ellis Act. Many of whom are also Real Estate agents. This report is not anti-landlord but it is anti-speculator. So that’s who you are defending if you’d like to get your terms straight. It’s the same thing either way. If a building is not viable then the owner will either Ellis or sell. And if he sells, any buyer will Ellis anyway. Some owners feel bad about Ellising and so it is useful to have a group of people who will take on that burden for them. In the end, you cannot force someone to run a business that is a terrible proposition. Why on earth would you want to? You are a Landlord and a speculator. You are also friends with some of the worst Ellis Act offenders that have been publicly reported. And above all – you are a racist troll. Thats a joke coming from Conway: his developer friends can make all the money selling million dollar condos – but lets make small property owners provide rent controlled housing forever. Small Property owners are getting out of the business because rent control doesn’t work. Either vote to REPEAL RENT CONTROL / REFORM IT – it should subside only those who need it only, and it should be paid w/ tax dollars not by private citizens. Enough entitlement in San Francisco. Welcome Tech!!! Small Property Owners can’t subsidize low paying tenants forever. Either vote to REPEAL RENT CONTROL / REFORM IT – it should subsidize only those who need it only, and it should be paid w/ tax dollars not by private citizens.